Let's enjoy a teatime treat that my granddaughter, Cissy and I made. I've shared this recipe before, but these little treats deserve sharing again. Isn't my amaryllis that I planted after Christmas, so pretty? 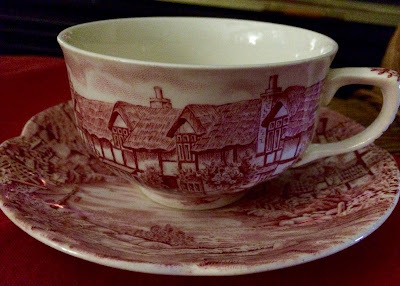 I love to pull out this favorite Johnson Brothers English Countryside, red transferware teacup, for the month of February. Here's sweet Cissy, ready to take her treats home to her family. She is such a bright little joy in my life, and we love cooking and laughing together. I think I got this recipe from the back of a butterscotch chip or chocolate chip bag, years ago. I hope you try them! Stir in the crisp rice cereal. Press half of this mixture into a buttered 8" square pan. Chill. Set remainder aside. (If you wet your hands it makes pressing easier). Stir over hot water, the chocolate chips, powdered sugar, butter and water until chocolate melts. (This can also be done in the microwave being careful to do on lower power and in a microwave safe bowl). Spread over chilled mixture. Top with reserved mixture. Chill. Cut into squares. This recipe does sound delicious, Kitty. Sweet teacup and saucer. I love Johnson Bros English Countryside transfer ware. AND....yes, your Amaryllis is beautiful! Oh my Kitty, such a lovely post!! City’s is such a little doll! Those treats look scrumptious! I’ll have to make them with my granddaughter! Your amaryllis is gorgeous! I haven’t planted one in years! Maybe next year! You’ve inspired me to use my red transfer ware teacups! They are some of my favorite too! How is your sweet mother doing? So sorry! Just noticed that auto spell misspelled Cissys name! Your amaryllis is gorgeous. That didn’t take long. No wonder Cissy is grinning. The ingredients list alone is making me wish that I had Rice Krispies. What a little sweetheart! The recipe sounds perfect for little bakers and a great treat with a cup of tea! I love that you make your tea time so special by using your beautiful cup and saucers! Yikes! I'm pretty sure I just gained a few pounds reading the recipe haha! 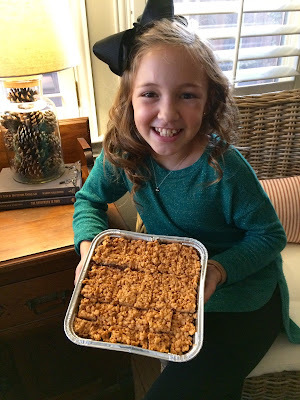 Those look SO good and what a fun treat to make with sweet Cissy! Thanks for sharing -- this looks like a keeper! 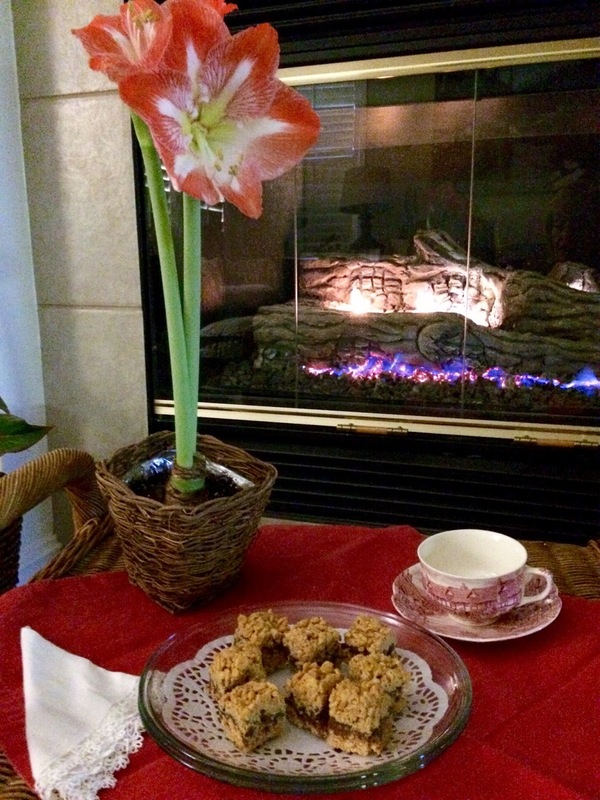 What a gorgeous teacup and adorable flowers:Cissy and amaryllis!The recipe looks yummy!Hugs! Oh Kitty, you really are an amazing Grandma. And that Cissy is growing up so fast, and is so wonderful. The look of love, pride and beauty from deep within is so strong on her face. I look at her and my heart skips a beat. Hi Kitty, you and Cissy must have so much fun baking in the kitchen together. I bet those fudge sandwiches taste so good. Thanks for sharing them at our Cooking and Crafting with J & J.
Cissy is becoming quite a baker! I'm intrigued by the yummy combo of butterscotch, chocolate and peanut butter. Your pretty red transferware is perfect for Valentine's Day. thank you so much for this one. 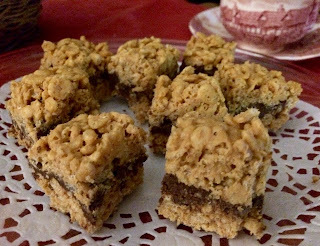 my grands love the rice cereal bars with marshmallow, so I know they will love this. Your grand girl is doll baby. I know she loves being with you. The little neighbor kids would really enjoy making and eating these! You are so smart planting armarylis! It is so pretty. I know Cissy is a joy and she loves you very much! Oh yes, the amaryllis is lovely!!!! So is the precious Cissy with her tray of treats. I love the pattern and color on the teacup and saucer and I would love to sit there in front of the fireplace and enjoy a fudge sandwich and cup of anything with you! Hope you have a nice week Kitty......Hugs. Oh, my! Those sandwiches look amazing! I will have to try them for my husband and son. :) Praying for you, sweet friend. God bless you! Such a pretty amaryllis plant. The recipe looks yummy. That Cissy has the prettiest smile. Your sweet treat looks amazing and has my mouth watering. Thank you for sharing. Thinking of you, dear one! I will email soon! Much love to you! One of my favorite cookies is the baked one like this, but I love the idea of a nobake! Yum! I think the grandkids are going to be enjoying this one! You and Cissy can make these for Mr Delightful any time - he'd be all over these! How wonderful! I love Counrtyside and your Amaryllis is gorgeous! The recipe sounds absolutely scrumptious! Have a lovely week and thanks fo lining to Tuesday Cuppa Tea! Yum Kitty, these look delicious!! I don't remember this recipe from a previous post, so I'll have to be sure and pin it. 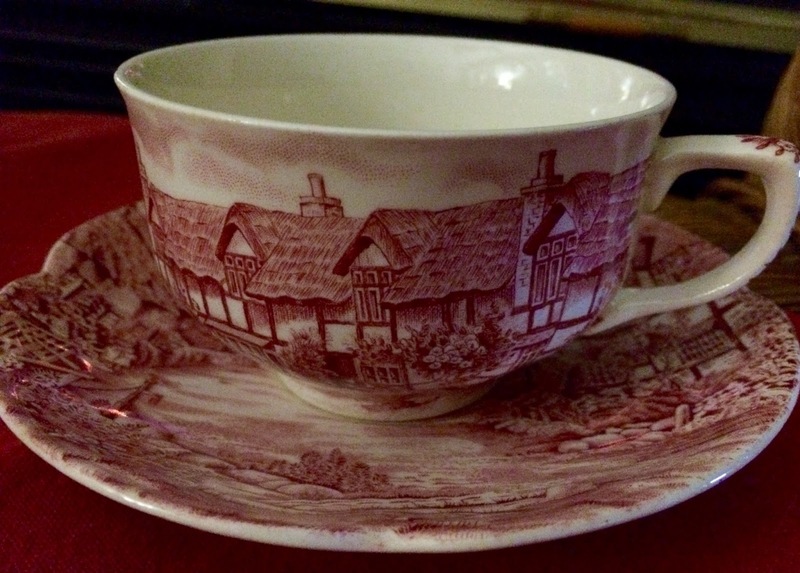 :) I love, love that teacup and saucer; those English country scenes always make me smile. Cissy is really growing up, isn't she? She has the sweetest smile; she will always remember these times spent with you. Have a great weekend, Kitty. Dear Kitty you are so blessed to make wonderful baking memories with your adorable Cissy and she with you. Thanks for the recipe too. They look delicious Kitty! Your grands are so fortunate to haave such a wonderful grandma!! Thanks for sharing with SYC. Your fire sure looks cozy today, we are sitting here with ice on the windows, looks like freezing rain. Your Crunchy Fudge Sandwiches will be just the snack to keep us cozy. You stay warm and safe in this bad weather. Hope you are having a great day and thanks so much for sharing your awesome post with us at Full Plate Thursday. I think my grandsons would love these! Pinning!